The White House wants NASA to put boots on the Moon by 2024. That seems... unlikely. Two weeks ago, Trump and the White House released a budget drastically cutting NASA’s exploration budget. Yesterday, Vice President Mike Pence announced he wants NASA to land astronauts on the Moon by 2024. OK, let’s dig into this a bit. Yesterday, just prior to a meeting of the National Space Council in Huntsville, Alabama, Pence made a speech exhorting NASA to return to the Moon. This has been said before — oh, so many times over so many administrations — but this time, instead of a vague target date ten or twenty years in the future (I never believe any claim where the deadline is quoted rounded off to the nearest decade with an “s on the end), he set a specific date, and one that is, to be frank, very soon: 2024. Is it actually possible to leave a new set of bootprints on the Moon in five years? The way things stand right now, I have serious doubts. Something, and something big, will have to change. The big problem here is money. Just straight up funding. Just 15 days ago, the White House proposed budget cuts to Exploration, including a 9% cut to the Orion crew capsule, and 17% to the Space Launch System giant rocket. There are many details to this, but NASA is long overdue and way overbudget on SLS, so money was shifted around to get the first stage of it built, deferring work on the critical Exploration Upper Stage to help them focus. As it stands right now, even if it gets built in the next few years the SLS doesn’t have the capability to get humans on the Moon and won’t for some time. 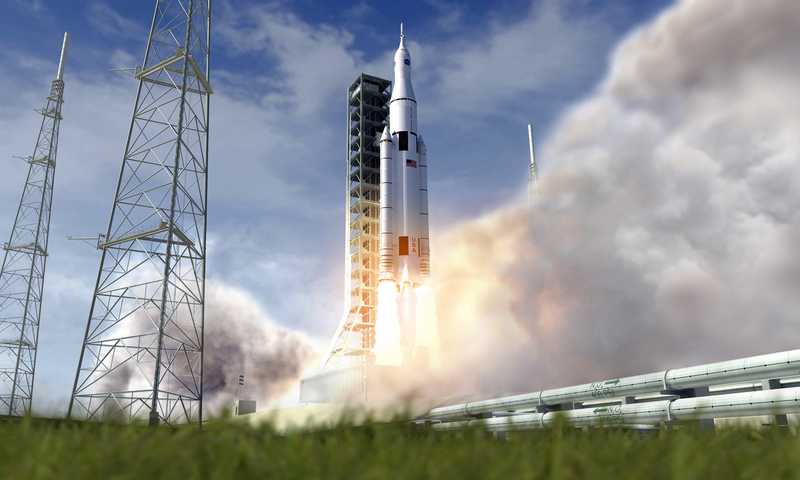 SLS was supposed to be used for the first test flight of Orion around the Moon in 2020, but (as long predicted) it doesn’t look that will happen. NASA Administrator Jim Bridenstine said as much in a shocking bombshell of a speech just two weeks ago, saying we can use commercial rockets (meaning a Delta IV Heavy or Falcon Heavy) to do this if necessary. But that costs money. An Orion is not like a kid’s car seat that you can just swap from one car to another; a lot of work has to be done to change the engineering and make it compatible with a different rocket. That takes time and costs money. I remind you, the White House cut NASA’s money two weeks ago. Brindestine’s words were echoed by Pence yesterday, who also said that if SLS isn’t ready in time, commercial rockets can be used. But with the budget cuts on top of an accelerated time frame, well, I have my doubts. Maddeningly, right after Pence’s speech yesterday, Bridenstine then stood up and said that to do all this by 2024 we need SLS. Just two weeks after saying we didn’t need it. When I read that I almost bit my tongue off. It doesn’t sound like the White House or NASA’s top admins have sat down together and worked out an actual, executable plan. All these contradictory announcements one after the other really feels seat-of-the-pants. That’s not a great way to send humans to the Moon. So that’s my biggest initial beef with this. If the White House were serious they’d add a billion or three bucks to NASA’s budget (and have a consolidated message about it). Until they do that, this strikes me as just more empty words, which we’ve been hearing from every administration since Bush the First. And this doesn’t even include Congress, which has to approve any funding for this as well… and I’m skeptical they’ll dive in on this plan given the past NASA funding tension between them and the White House. 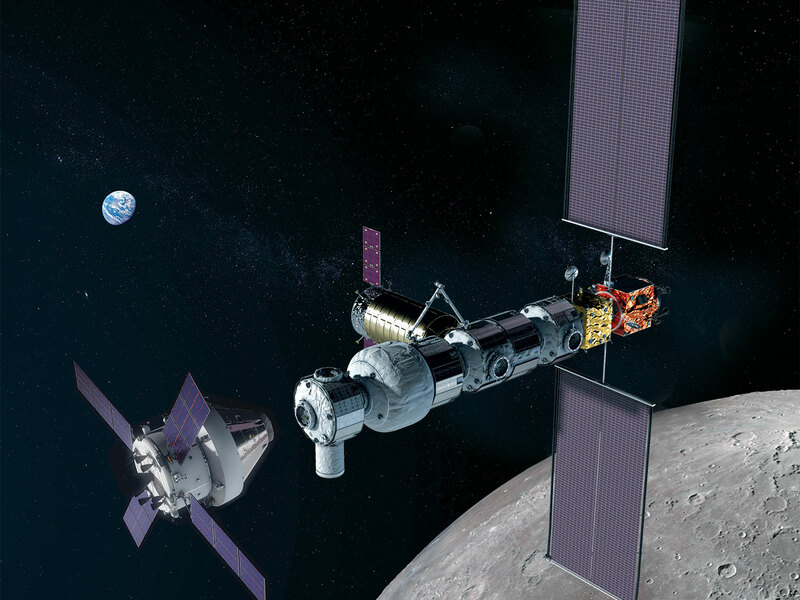 To do this, NASA has plans of building a Lunar Gateway, a satellite orbiting the Moon that will serve as an outpost and staging platform for journeys to the surface. Lockheed-Martin says they can make a stripped-down version that can be ready in a few years for the mission. Let’s say they can do that. But, at the moment, there’s no lander either. If we get a rocket and if we get a crew capsule and if we get a Gateway, that gets them into orbit around the Moon. To get down to the surface you need a lander… and NASA hasn’t started designing one yet (they just last month put out a call to design one with proposals to be judged by this summer). And that’s not to mention spacesuits, tools, equipment, and and and. An earlier NASA announcement indicated wanting to put humans on the Moon by 2028. Speeding this up by several years puts a lot of pressure on NASA and its contractors to get this done. To meet Pence’s deadline, they have 5 years to get all this not just designed, built, and tested, but also actually working and ready for field use on the Moon. And I remind you again that there’s no budget for any of this yet. Even if there were one, where would that money come from? If it comes from NASA, what programs will be cut partially or in full to free up several billion dollars for this? What critical science will be unceremoniously canceled? I’ll also add that what was presented today wasn’t really a plan. It’s more of a notion. I’d like to see details, hard details, on how this can be done in half a decade, and how it can be done safely and sustainably. That might be my biggest overall concern. Doing things in a hurry is a recipe for disaster. I mean that literally, in that rushing through something so fiercely complex can and will result in mistakes that will be very costly. Have we learned nothing from Challenger? From Columbia? I also mean it figuratively, in that I do not want a repeat of Apollo. I don’t want to spend a vast amount of money on something that only has the goal of putting people on the Moon in a hurry. We need to do this so we can sustain it, keep it up, and not just plant a flag and go home again. This accelerated schedule leaves no room for that, and I fear in the long run this will result in a colossal waste of taxpayer money and NASA’s time even if it all goes smoothly. A final thought for now. It’s easy to think I’m simply pooh-poohing this, that I’m being a naysayer. Look back to 1962, and see how many people said Kennedy’s goal of putting humans on the Moon before 1970 was impossible. Yet we did it! But that’s a false equivalence, because Kennedy put his money where his mouth was. NASA’s budget grew to over 4% of the US budget for Apollo. Today NASA’s share is less than half a percent. And Trump’s new budget cuts even that. So right now it appears we have no plan, no rocket, no gateway, no lander, and no funding. So what do Pence’s words mean then? Let me be clear. I want us to go back to the Moon. To go back, to explore it scientifically, and to stay there. I want it to be the jumping off point for us to explore the solar system. And I absolutely do think, done correctly, NASA can achieve this, and much much more. The people who work there have dedicated their lives to this goal. I strongly support NASA with this. If they can do this, and do it right, then I will be among the loudest voices applauding them. It’s not NASA I have a problem with at all. But Pence? I don’t trust his motivation and I certainly don’t trust his words. They sound to me just like every other promise made by this administration: As empty as the vacuum of space.